Stock photo of the Town of Banff viewed from Norquay Meadow along Mount Norquay Road during winter after snow fall with Mount Rundle (2949 metres/9675 feet) and Tunnel Mountain (1692 metres/5551 feet) to the left, Banff National Park. The impressive snow covered mountains surround the town of Banff. 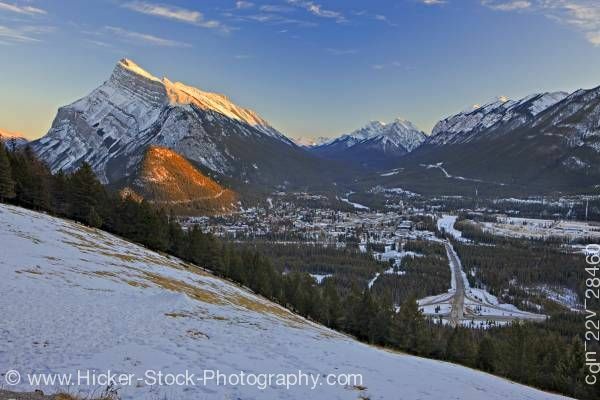 This stock photo shows the town of Banff viewed from Norquay Meadow along Mount Norquay Road during winter after snow fall with Mount Rundle and Tunnel Mountain to the left, Banff National Park, Canadian Rocky Mountains, Alberta, Canada. Banff National Park forms part of the Canadian Rocky Mountain Parks UNESCO World Heritage Site. This amazing view from the snowy Norquay Meadow is the town of Banff and its impressive snow covered mountain view. The town of Banff sits in a valley surrounded by these majestic mountains. Evergreens run down the meadow into Banff. The sun glows on the top of the Canadian Rock Mountains. Town of Banff viewed from Norquay Meadow along Mount Norquay Road during winter after snow fall with Mount Rundle (2949 metres/9675 feet) and Tunnel Mountain (1692 metres/5551 feet) to the left, Banff National Park, Canadian Rocky Mountains, Alberta, Canada. Banff National Park forms part of the Canadian Rocky Mountain Parks UNESCO World Heritage Site.